Favored since the time of the ancient Greeks as an old proverb states: “I, Borage, bring always Courage;” people believed a tea brewed from borage leaves gave courage as well as favor to the one who drank it. Ancient Celtic warriors drank wine flavored with borage for courage in preparation for battle. Henslow suggests that the name is derived from barrach, a Celtic word meaning “a man of courage”. As Crusaders marched off to battle, their sweethearts bid them adieu by placing the star-shaped blossom of the borage in the wine cup. They went forth with courage and vigor, since borage was also reputed to dispel depressed moods, without side effects. 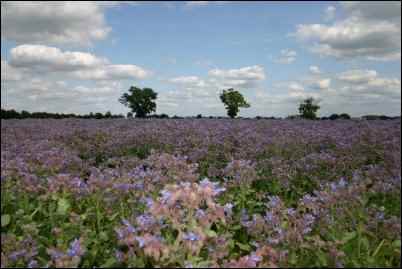 The English have always associated borage with courage, even to pronouncing it to rhyme. Western Europeans liked borage as a cooked vegetable; they often ate the tenderest leaves raw in salads. Easily grown from seed, borage is not particular of its growing conditions. Seeds may be sown in autumn in warmer climates and will produce flowers in May. 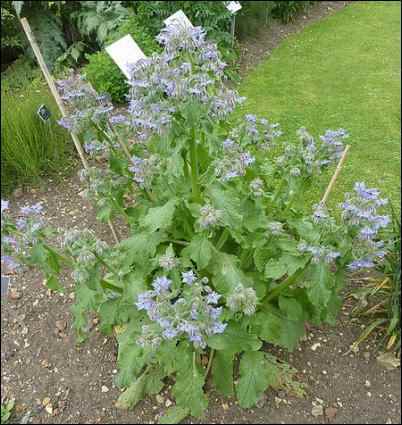 A prolific self-seeder, borage needs sprawling space for its mature growth-stage. Discourage weed competition in its early growth period by hoeing. Borage is considered beneficial to strawberries. Borage will continue to bloom until first frost. Its blue, star-shaped blossoms are favored by bees. Pot up new seedlings the plant produces and transfer to a greenhouse for continuous bloom through the winter. A blooming borage plant is so pretty, it should be grown in the flower garden more often. Grown from seed which is directly sown, just plant your seed in late fall or early spring after the ground has warmed up. 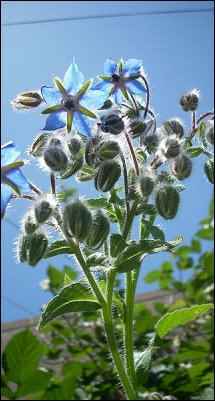 You can have borage from year to year as it re-seeds freely. Borage seedlings can be transplanted easily however the taproot of a mature plant makes it difficult to transplant. A sturdy, luxuriant annual which grows two to two-and-a half feet tall, borage flourishes in ordinary soil. It will even do well in a light, poor, dry soil as long as there is plenty of sun. However, borage will benefit from a generous amount of well-rotted manure being worked into the bed before planting. Its preference is a dry, sunny location with well-drained soil. This herb’s rough, somewhat sprawling growth habit requires lots of space. Setting plants ten to twelve inches apart will give them growing room. Foliage is coarse and covered with grayish hairs which gives the plant a fuzzy appearance. Its leaves are oval, rough and hairy, growing six to eight inches in length. The flowers are borne in leafy clusters at the tip of the stems which bend way over so that their faces are hidden. Blossoms are five-petalled stars with prominent black stamen tips that grow in downward-turned clusters and open the color of clear blue, fading to pink and lavender at maturity. Bees enjoy working a borage plant and its flowers yield an excellent honey. Sometimes borage acts like a biennial and you will have to wait until the second year of growth for flowers. Toward the ends of summer, I sometimes cut back the plant by a third. If not, the hollow branches get so heavy at the ends, the weight will cause the entire branch to break off at the stem. Borage can be one of the loveliest greenhouse plants. Just before frost, pot up one of the young plants from the garden and it will come into bloom early in the year with a continuous display of flowers until late spring. There are also varieties that produce white, red or violet flowers. The white form (Borago laxiflora) is a prostrate perennial with lighter green stems and leaves, and dark brown filaments. Borage is said to strengthen the resistance of any plants nearby to insects and disease. Plant beside your strawberries as these two plants are beneficial to each other and it may control tomato worm if planted near tomatoes. Hoe surrounding soil frequently to discourage weed competition. Gather the leaves when the plant is coming into flower. The young tender leaves are the ones you pick for tossing into a salad but sometimes lose their mild cool flavor after the herb has blossomed. Down through the centuries, herbalists have always had something good to say about borage. Rich in potassium, silica and calcium, the fresh plant is high in Vitamin C. Borage is known to strengthen the adrenal glands. It also promotes the activity of the kidneys. The juice in syrup was thought to be a remedy for jaundice, itch and ringworm. In the past, it has been given to reduce fever, soothe nervous conditions, stimulate production of milk in nursing mothers and relieve sore throats and inflammation. Decoctions of borage flowers are taken to relieve fevers, bronchitis, and diarrhea among other ailments. The distilled water was considered effectual in curing inflammation of the eyes. Make an infusion of this herb by steeping one ounce of leaves in one pint of boiling water. Take in wineglass-full doses. Poultices made from the leaves are reported to be cooling and soothing and so are applied to external inflammations and swellings; compresses of the leaves have been used to relieve congested veins in the legs. You can even apply fresh leaves to relieve insect bites. The flowers, candied and made into a conserve, were deemed useful for persons weakened by a long sickness. The herb is still taken to help dispel excess elements from the body, as well as having a soothing effect on the digestion. Caution should be exercised in the internal use of this herb because its tannin content makes it slightly astringent. Borage also contains toxic substances which may cause liver damage if consumed in large quantities over a long period of time. The seed oil is the richest plant source of gamma-linolenic acid and potentially valuable as a dietary supplement. 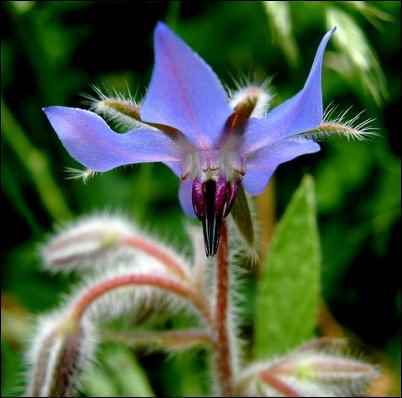 Borage, cooked with honey, has cured hoarseness of the windpipe and larynx. The French used a tea, sometimes combining borage with hyssop, in treating fever and pulmonary complaints. By promoting the activity of the kidneys, borage acts as a diuretic; sometimes it acts as a mild laxative. At one time the ashes of burnt, fresh leaves were considered good for the sore mouths of children. beverages or candy them for dessert trimmings. Gather borage blossoms on a clear summer day; dip in slightly beaten egg white, then sugar and allow to dry. Store in a dry place, well covered to keep out any humidity. Use to decorate cake, cookies & other confections. The tender, young, hairless leaves and stems are used for the cool, cucumber flavor they impart when chopped and added to salads, spreads, and drinks. The leaves are used raw, steamed, or sautéed like spinach. You can eat the stems, too; peel, chop and use them like celery. Cooked, the leaves lose their fuzziness and resemble a dark, green spinach. Young, immature rosettes of leaves are best for uncooked use. Dry leaves for tea. Both dried and fresh leaves are used to flavor soups and stews. When drying borage, remove leaves from the succulent stem. Borage tends to turn brown or black without good air circulation. Borage blends well with dill, mint and garlic. The leaves and stems enhance cheese, fish, poultry, most vegetables, green salads, iced beverages, pickles and salad dressings. The best way to store for long-term use is as a flavored vinegar. In some parts of France, the blossoms are cooked as fritters. As a good cleanser for oily skin, combine a borage infusion with milk, buttermilk or yogurt. It is in the Claret Cup that borage is pre-eminent. To quote Mrs. Seely’s Cookbook published in 1902: “the borage should not be allowed to remain in the cup, but it will impart an aroma that nothing else can …a sprig of borage added just before serving….” Adelma Simmons states emphatically that borage is the chief flavor of the Claret Bowl, and goes on to give a recipe for a pretty punch with a cool, cucumber taste. Claret Bowl: one stalk borage – stem, leaves and blossoms or twelve leaves and blossoms – for garnish; one gallon claret or dry, red table wine; juice of three limes; one cup granulated sugar; one sliced lime for garnish. In a large open-mouthed jug, steep borage in wine, lime juice and sugar at room temperature for at least three hours before serving. Of, if preferred, in a refrigerator for twenty-four hours. At serving time, pour wine mixture over a block of ice in a punch-bowl. Decorate with the lime slices, fress blossoms and leaves. Makes thirty-six punch-cup servings. One last oddity about borage: throw its leaves on the dying barbeque coals for a small firecracker display. Sparks and pops will result, due to the nitrate of potash in borage! The Welch called borage ‘llanwenlys’, meaning herb of gladness. Drawings of borage blossoms decorated page borders of ancient Books of Hours. The young tops of borage were sometimes boiled as a pot-herb. Borage is said to strengthen the resistance of nearby plants to insects and disease. Borage has the same digested flavor as cucumbers without the digestive upset that vegetable sometimes causes. Sometime silica in the leaves can irritate the skin even when dry.